Why is it so brown? 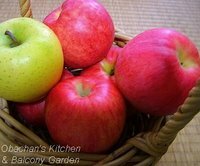 I used three different kinds of apples (jonagold, fuji and ohrin) because this site recommended using a combination of apples. They were peeled, cored, chopped and immediately thrown into my crockpot. I also added 1/2 cup water and apx. 2 teaspoons of lemon juice, AND one cinnamon stick (apx. 5 cm), then closed the lid and set the timer to 4 hours (on high). After about 2 hours, the chopped apples in the crockpot looked soft, but still the color was not very different. Then I started bloghopping, enjoying the wonderful aroma from the cooking apples, and forgot about checking the crockpot. When I looked into the pot after the timer went off, what I saw was this pinkish brown stuff. So... is this the way it should be when you make applesauce in a crockpot? Or did I heat it too long? Or is it because of the cinnamon stick? What do you think? Is this sauce bad for health? But this applesauce tastes delicious! I'm glad I didn't add any sugar, because it's quite sweet. And I already baked something with it, and had a GREAT success. Maybe you need to add a little lemon juice to it? Still looks delicious. I love the way you photographed the jars from this angle. Looks very nice. I don't cook very well and I am not sure if this tip will help. I always soak my sliced apples in cool salt water for a while before serving them in a fruit platter and they don't turn brown. It's the normal color for homemade applesauce I think! Totally normal color! Maybe the cinnamon stick made it juuust a little browner. Thanks. I’ve seen this kind of photo on someone’s foodblog before, and thought this was a perfect chance to try it myself. Glad you liked it. Yeah, we do the same thing here to prevent sliced apples from turning brown, but I totally forgot about it. Oh, really? I googled but somehow I couldn’t find any photo of applesauce as brown as mine. Mmmmm… I, too, think the cinnamon stick contributed to some extent. I had the same brownish colour in my homemade pear jam from last year, and I used the recommended amount of lemon juice, so I think it's just how it naturally comes out. Mine always turns out that color as well. I figure grocery store applesauce must have some sort of preservative in it to keep it the lighter color. I am flattered to be the inspiration for your applesauce making, glad the baking turned out good as well! I think applesauce cooked for four hours is actually "apple butter", which is fantastic on crumpets, English muffins or toast. I don't think applesauce needs more than an hour or so, though I don't make it very often. 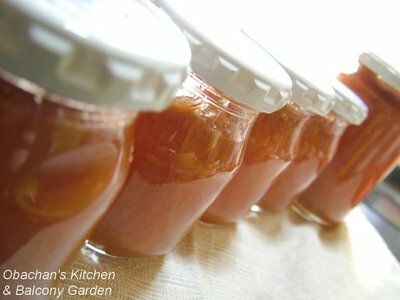 Nice looking apple jam! Dai suki! Anyway, please tag my blog obaachan. Kore wa Kelvin desu! Yoroshiku onegaishimasu! I've yours in my favorite folder cuz it's sho good! Maybe so. Pear jam sounds delicious. My sis made some last year and gave me some. I loved it on buttered toast. Yes, thank you for the inspiration. I’m going to make it once in a while and keep some in my kitchen all the time. Wait, are you talking about making it in a crockpot? Most of crockpot applesauce recipes (American recipes) I saw on the net said 3 to 4 hours on high. The chopped apples were still chunky and rather crispy in the pot after one hour. But maybe 4 hours was too long in my case... All the apples I used were very sweet, I didn't add much lemon juice, and the temperature of HIGH on Japanese crockpots might be higher than that of American ones. I'll try 3 hours next time. Oh, hi Kelvin. Kochira koso yoroshiku. OK. I’ll tag you for the meme. Looking forward to reading about your secret place! Aha, I see... I usually just make applesauce in a saucepan. I guess I wouldn't have thought of doing it in a crockpot. I would think that would expose the apples to oxygen a lot more than a saucepan, though, which would brown them. Depending on how quickly the apples start disintegrating, I have sometimes pushed them through a sieve... This is less necessary with apples like the McIntosh variety, which seems to become like a paste quickly. I make a huge batch of applesauce every year for all of my friends. Ilearned how to make it when I was really little from my grandpa and have changed the recipie to my tastes over the years. They start calling asking for it in early October! Brown is a normal color for homemade applesauce. Cinnamon will darken it. Instead of water I use pinneapple juice - it helps naturally sweeten the applesauce and also helps the apples from truning darker, just like lemon does. Mine is mild with no intense flavor, so I think it’s applesauce. So this is a normal color. That’s a relief. Thanks! :D Pineapple juice sounds like a good idea, but I’d rather use it when I make applesauce with more tart apples. I have no problem with the color. When I make applesauce I use unsugared applejuice instead of water, it is sweeter. I never use sugar. Good for you, it looks delicious!